Rubella (German Measles) - body, last, viral, contagious, causes, What Is Rubella? Rubella (roo-BEH-luh) is a viral illness that causes a rash. 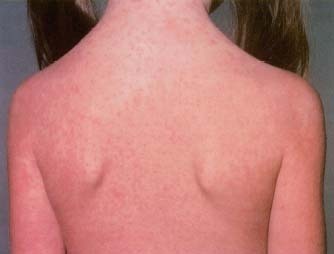 Many people know the disease by its other common name, German measles. Rubella is caused by the virus of the same name. The word "rubella" comes from the Latin word for "little red," which originally described the infection's telltale rash. It also is known by the names German measles and three-day measles, because of its short duration. Rubella infection usually is not serious. Most people have mild symptoms and a faint rash. However, if a woman develops rubella during the early stages of her pregnancy, it can cause miscarriage * , premature delivery * , and multiple birth defects, known as congenital (kon-JEH-nih-tul) rubella syndrome (CRS). Babies born with CRS may have cataracts * and other eye problems, microcephaly * , mental retardation, deafness, heart defects, enlarged liver or spleen, and other problems. In the United States, the disease was widespread before the current rubella vaccine was introduced. A rubella epidemic * in 1964 and 1965 spawned an estimated 12.5 million cases and 20,000 cases of CRS, according to the U.S. Centers for Disease Control and Prevention (CDC). In 1969, the year the vaccine became available, 57,686 cases of rubella were reported to the CDC. Since then, the number of U.S. cases each year has dropped steadily. The CDC reports that most cases of rubella since the mid-1990s have been seen in young Latino adults who did not receive the vaccine as children. In 2001, there were only 19 cases of rubella reported in the United States, versus 1,400 a decade earlier. The CDC credits global immunization efforts, particularly in Latin America, for the decline. This child has the characteristic rash of rubella. The rubella vaccine has greatly decreased the number of cases in the United States since it was put into use in 1969. Although rubella is generally not serious in otherwise healthy people, in pregnant women it is associated with birth defects and miscarriage. leave the mouth and nose when the person sneezes, coughs, or talks. Then other people may inhale the drops, or the drops may land on something that other people touch. Once people get the drops on their hands, they can infect themselves by touching their mouth or nose. The virus enters through the mucous membranes * there and takes hold in the body. Pregnant women also can pass the infection to the fetus * in the womb. What Happens When Someone Has Rubella? Symptoms of the illness are often mild, particularly in children. In fact, between one third and one half of all cases may not even be identified as rubella because the symptoms go unnoticed or cannot be distinguished from those of a common, mild respiratory illness such as a cold. Children with rubella usually develop a distinctive rash. It starts on the face as pink or light red spots and then spreads downward on the body. The rash is fainter than a measles rash, usually does not itch, and lasts from 1 to 3 days. Older children and adults may have symptoms of a viral illness before the rash appears, including swollen lymph nodes * (particularly in the area behind the ears and in the back of the neck), mild fever, runny nose, and conjunctivitis * . Adults also may experience joint and muscle pain and stiffness along with their other symptoms. * conjunctivitis (kon-jung-tih-Wtis), often called 'pinkeye," is an inflammation of the thin membrane that lines the inside of the eyelids and covers the surface of the eyeball. Conjunctivitis can be caused by viruses, bacteria, allergies, chemical irritation, and other conditions or diseases that cause inflammation. If a patient is suspected of having rubella, the doctor can confirm the diagnosis by taking samples of fluid from the mouth or nose with a swab. Samples of blood and, rarely, cerebrospinal fluid * may be collected as well. All of these will be examined for signs of the virus. The blood sample also may be tested for antibodies * to the virus. There is no treatment for the disease, and it is generally so mild that specific treatment is unnecessary. Over-the-counter medication such as acetaminophen (uh-see-teh-MIH-noh-fen) can lower a fever and ease pain in the muscles and joints. Infants born with CRS will be treated for any defects they may have developed. Most patients recover completely in 1 to 2 weeks, and in many patients the disease runs its course in as little as 3 days. Complications tend to occur more often in adults than in children. Temporary arthritis * , which can last up to a month, is common in adults who have rubella. Other, rare complications include inflammation of the brain (encephalitis, en-seh-fuh-LYE-tis), inflammation of nerves (neuritis, nuh-RYE-tis), and abnormal bleeding. If the infection occurs in a pregnant woman, it can lead to miscarriage, premature delivery, or congenital rubella syndrome. Vaccination is the best way to prevent rubella infection. The vaccine for rubella is given as part of a combined vaccination for measles * , mumps * , and rubella called MMR. Children receive the MMR vaccine in two doses, usually at age 15 months and 5 years, before entering kindergarten. Doctors recommend that women who are old enough to have children be tested for immunity * to rubella, and if the woman is not immune to the virus, she should be vaccinated. U.S. Centers for Disease Control and Prevention (CDC), 1600 Clifton Road, Atlanta, GA 30333. The CDC is the U.S. government authority for information about infectious and other diseases. It provides information about rubella at its website. KidsHealth.org . KidsHealth is a website created by the medical experts of the Nemours Foundation and is devoted to issues of children's health. It contains articles on a variety of health topics, including rubella.